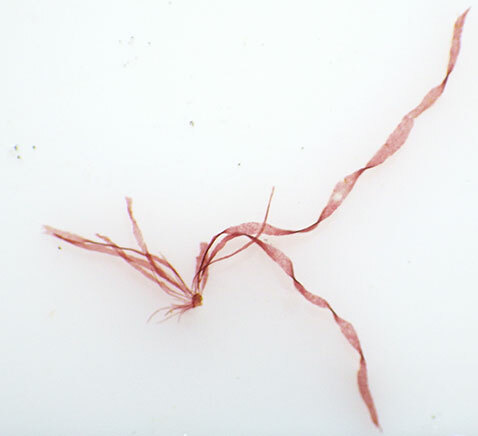 Description: Ribbon-like rose-red, 10-800 µm broad, simple, sinuate, unbranched blades often curled at margins, one cell in thickness, arising from small disk on cell in thickness growing epiphytically on various algae. Tapering to a narrow point with a single apical cell. Marure cells rounded, 10-20 µm in diam., and often in regular lateral and vertical rows, but becoming more irregular as blades mature. Habitat: Epiphytic on Fucus, Zostera and various smaller algae in the lower intertidal and shallow subtidal. Key characteristics: Epiphytic habitat. Unbranched, curled blades one cell in thickness. Distribution: Svalbard south to Canary Islands; western Mediterranean and Adriatic; west coast of Africa south to South Africa, west coast of N. America. Photographs: Carnsew Pool, Hayle, Cornwall, England; on Fucus serratus. 14 Apr 2018 © David Fenwick, 16 April 2018. Top: habit of plant removed from Fucus serratus (longest blade about 4 mm. 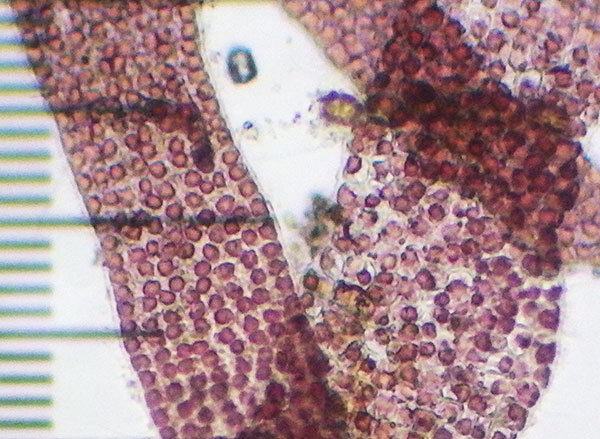 Bottom: cells of young and mature blades (scale = 10 µm). Site © M.D. Guiry 2000 - 2019. Important copyright notice: all text, design and photographs on this site are copyrighted by M.D. Guiry unless otherwise stated and all rights are strictly reserved. Click here for copyright information and contact. Website design: 249 Design Studio. Site maintained by M.D. Guiry (michael.guiry@nuigalway.ie). There have been 8736625 page loads since 1 January 2014 on 25 April 2019.